Skin is the largest organ of human body and hence must obviously be taken care of. Even though almost all modern-day individuals, because of leading an extremely hectic life, does not tend to pay much attention unless an issue crops up, I personally feel they should try offering protection even if it is in the simplest ways such as drinking substantial amounts of water daily, adhering to a balanced diet, working out regularly, and performing CTM (cleansing-toning-moisturising). Well, in the following write-up, let us try to explore a few popular treatments, readily available nowadays,which assure to keep certain common skin disorders at bay. Also known as chemexfoliation or derma peeling, this particular procedure aims at correcting a series of irregularities such as wrinkles, fine lines, and dark blemishes- a consequence of roaming outside in sun for prolonged periods. A solution containing alpha hydroxy acid (AHA), phenol, and trichloro acetic acid (TCA) in varying quantities is applied cautiously for ultimate skin rejuvenation. This treatment has managed to acquire widespread recognition all across the globe with several individuals undertaking it every year. Microdermabrasion can lighten acne scars and pave way for a youthful appearance by providing relief from age spots.Small crystals are sprayed via a handheld instrument for thorough exfoliation of skin’s diverse layers. Although laser therapy is believed to stimulate collagen production and opted for as an alternative to facelift, certain kinds could vaporise or destroy skin cancer tumours as well. The physician uses strong light beams for removing affected tissues without causing much bleeding. Risks of pigment loss and scarring are a tad bit more in this particular case. 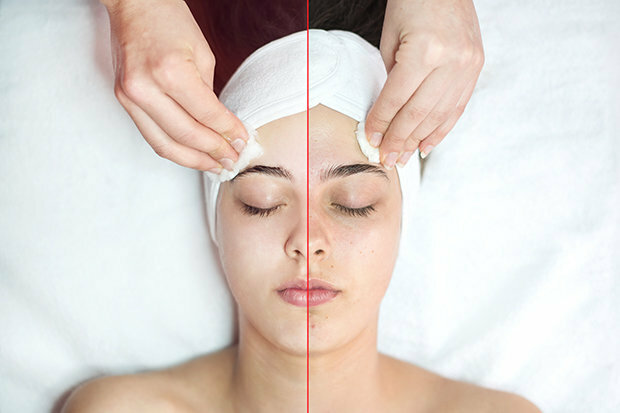 Thermage is basically a facial involving no exfoliation but designed specifically for tightening and enhancing contours present in one’s neck as well as face. Several regulated radio waves heat varied skin’s layers and foster collagen development. Its demand is increasing at a considerable speed probably because the benefits are long-lasting and immediately apparent. A mixture is prepared from hyaluronic acid and collagen protein, which is then, penetrated into skin through intense ultrasound waves. It can effectually hydrate skin and give a dewy glow. Now isn’t that absolutely amazing? The results last for a day or two working most remarkably around the eyes. Also referred to as zit killer, cortisone shots can shrink massive inflammation within 48 hours. But owing to technological advancements, the injection has gone through some excellent transformation, thus, claiming lately to reduce any cyst, regardless of its size and texture, along with associated redness and swelling in a day or so. The six treatments specified above can improve skin to a great extent but only when performed by a highly proficient and adequately experienced professional. Glebe Medical Centre, noted to offer quality healthcare assistance, treasures a talented team of practitioners, who promises to carry out each process with utmost precision and generate best possible outcomes within a stipulated time period.